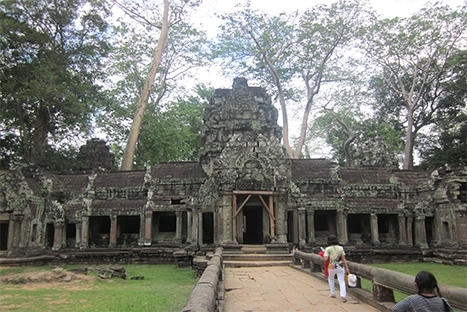 Vietnam, Laos and Cambodia package tour. Discover the natural beauty, fascinating history and friendly people of Cambodia, Vietnam and Laos on our 16 days tour. 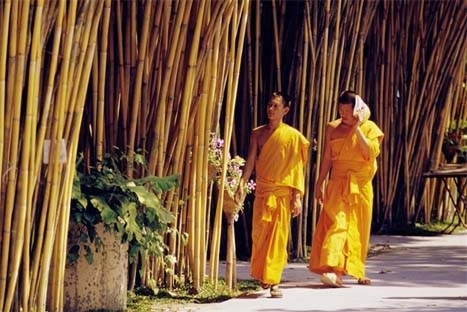 We begin in Lao to experience the peaceful temple lined streets of Luang Prabang. In Vietnam, discover the country’s highlights – from the capital Hanoi and the spectacular vistas of Halong Bay to the historical charms of Hoi An and Hue and the bustling streets of Saigon. 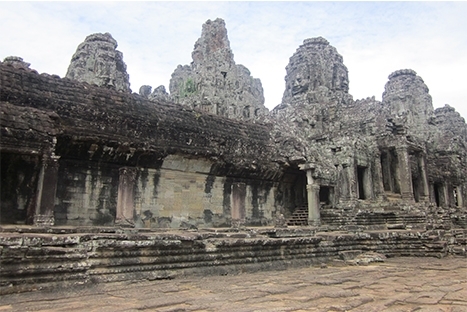 The tour links to Cambodia after 3 days deep into palm fringed canals of the Mekong Delta, the waterway along Mekong River leading to the charming capita of Phnom Penh, before experiencing the incredible temples of Angkor. Upon arrival at the airport, you are met and transferred to the hotel. 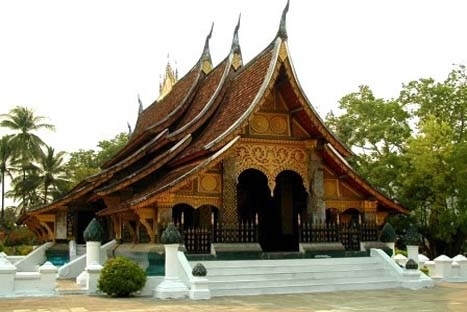 Luang Prabang is perhaps the best-preserved traditional city in Southeast Asia. 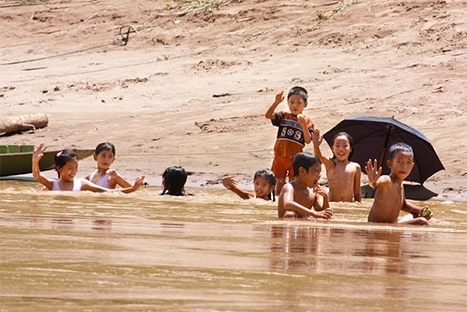 The tranquility and charm of this town with its splendid natural scenery and cultural sights make it one of the most delightful places to visit in Laos . After a short rest, we visit the impressive stupa of Wat Visoun and the shrine of Wat Aham, Wat Mai; we then climb up to the top of Phousi Mount for an enjoyable exploration of the sacred, gilded stupa as well as a beautiful sunset view of the city and the Mekong River. From there, we explore Street Night Bazaar, where you can find the lovely collection and handmade textile by local and hill tribe people surrounding Luang Prabang. Overnight in Luang Prabang. In the afternoon, drive to the beautiful Khuangsi Waterfall where you can splash around in the pools or walk along the forest paths, return to Luang Prabang by late afternoon and continue to Ban Phanom, a well known weaving village. Overnight in Luang Prabang. 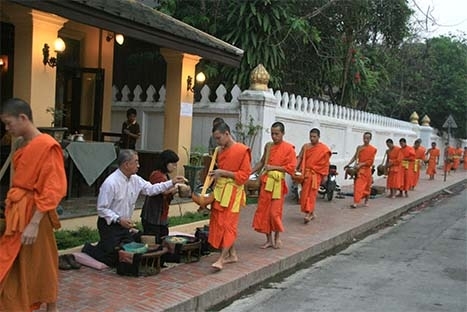 This morning you may want to wake up early and participate in the daily early morning ritual of saffron-clad monks with their black Alms-giving bowls being given offerings from the local people. Free time for relax for relax until time for transferring to airport for flight to Hanoi. 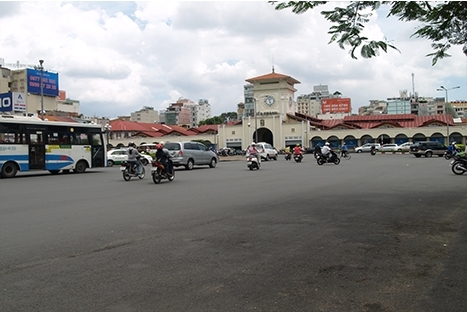 Our local guide in Vietnam will meet you at Noi Bai airport and bring you to your hotel in Hanoi city for overnight. In the afternoon choose one of three museums as you prefer Ha Noi Fine Art museum, History museum or Ethnology museum. Your day ends with a short old quarter walk then attend 45 minutes Water Puppet shows at Thang Long theater. Overnight in Hanoi. In the morning, take further cruise to explore the beauties of the Bay before returning to the Wharf. Enjoy brunch on board before disembarking. On the return to Hanoi, we stop on the way at Dong Trieu Ceramic town for a short time to visit the pottery shops. Drop all at hotel in Hanoi for free and Overnight in Hanoi. Free time in the morning before transferring to the airport of Hanoi for noon flight to Hue. Transfer to a the city check in your hotel. Start your exploration of Hue at the Imperial Citadel where the Nguyen Dynasty ruled between 1802 and 1945. After exploring the ruins of this wonderful monument take a cyclo through the ‘Old City’ to Tinh Tam Lake where the Emperors used to come to relax, full of lotus flowers in summer there are many local style coffee shops around the lake where university students come to study. Following is the visit one of largest garden houses (Nha ruong in Vietnamese) An Hien. Overnight in Hue. In morning we embark on a dragon boat sail along the Huong River to visit the Thien Mu Pagoda, and the tomb of Ming Mang King. In the afternoon transfer to Hoi An through the famous of Hai Van Pass. The car will stop for the visit to Cham Museum where display an open air collection of Cham sculpture. Overnight in Hoi An. 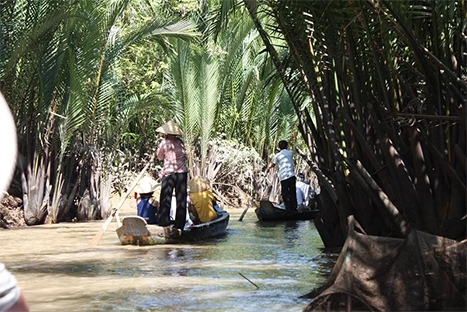 Discovery Hoian truly life by walking tour around this enchanting port town. Follow the narrow lanes lined with centuries-old houses influenced by Chinese, Japanese, French and European architectures and visit its numerous places of interest: the 400-year old Japanese Covered Bridge, the Phuc Kien Assembly Halls, the local fish market… Around the town we can see a numerous art galleries and tailor shops, get some made-to-order clothes if you like. The next tour is coming to the home of a craftsman in the old streets. Here you will have a brief introduction to the history, shape, and colour of the lanterns as well as the many stages of making them. After that you can make your own lantern, decorate, pack and keep it as a souvenir during the time in Hoian. In the afternoon, we transfer to Danang Airport for late flight to Ho Chi Minh City. Overnight in HCMC. Morning excursion to Cu Chi tunnels and take a guided tour with a veteran guide to gain deep insight and personal accounts of the wartime era. On arrival he will meet the group and take them on a guided tour of the tunnels together with our guide (his service is subject to availability). If desired (and not for the faint hearted and on own account) a round of bullets can be fired from anAK47 gun at a target range at the tunnels. Back to Hochiminh city for visiting the Reunification Palace, Notre Dame Cathedral and Ben Thanh market. Our car will pick up at your hotel in early morning. Upon arrival at Cai Be, embark a private boat to cruise around Cai Be Floating Market to see local people being selling, buying, exchanging goods from their boats. Visit local garden and house to see orchard, rice crisped producing process... After lunch taking a cruise along river to see peaceful tranquil life of villagers, admire marvelous natural setting of Mekong Delta region. 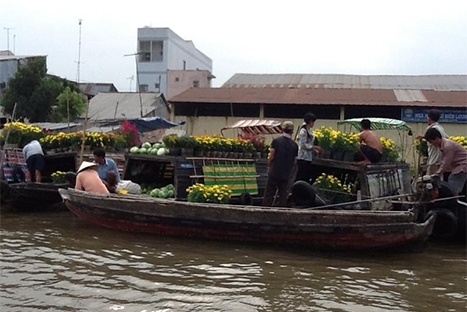 About 3 pm, the boat will arrive at Vinh Long, walking around to explore Vinh Long Market. Then transfer to Can Tho City for overnight. Cruising along the small and picturesque tributaries by boat, we will see the Cai Rang floating market (the nicest one with heaps of rowing boats). Take in the beautiful scenery and the daily activities of the locals who lives along the Mekong canals and you will roam through the village to visit a rice husking mill and a rice noodles making shop. Then continue going to Chau Doc via Long Xuyen. Check in on arrival. Visit the Sam Mountain to enjoy the breath-taking view on the Vietnamese-Cambodian border with flat rice fields and nice canals, visit caved pagoda. Overnight in Chau Doc. After breakfast, get on speed boat to Phnom Penh, going back one of the arms of the Mekong. Our guide and coach will pick up at Phnom Penh International Airport or Phnom Penh Boat Port, then transfer to hotel for check in. Then transfer to visit Royal Palace, Silver Pagoda, Preahkeo Morokot, National Museum & Central Market or Toul Sleng Museum. Enjoy welcome dinner at the local restaurant & overnight in Phnom Penh. After breakfast at hotel, then transfer to Phnom Penh International airport for flight to Siem Reap or Port for Express Boat to Siem Reap. Upon arrival, transfer to hotel for check-in. Lunch at the local restaurant. In the afternoon, transfer to visit Banteay Srei – The place just 30 kim from city center with the unique temple to worship the maiden of Kings, back to Siem Reap city for dinner with Apsara show and overnight. Morning breakfast at hotel then transfer to visit Tonle Sap Great Lake for Cruising, visiting fisherman’s life, floating fishing village dot the semi-submerged forest that lines the flood plant rim of the lake, back to visit Chantier Ecole-Artisan d’Angkor, the place are in the Ministry of Education was constructed in 1992 and this place renowned woodworking, stone carving and polychrome training center and workshops. Free tour of the classes and workshops offer a glimpse into the unique skills training program, teaching young artists in the techniques and styles of classic Cambodian artistry before transfer for departure lunch at local restaurant in the town. After lunch, visit old market for shopping until transfer to the airport for flight off.